I admit it; I have a "dish" addiction. Spotted these, and just had to have them. 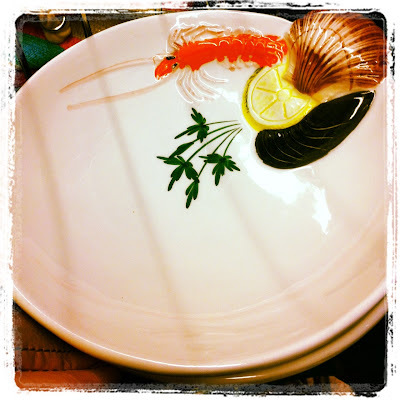 Fun little pasta dishes with seafood motif - perfect for a recipe that I have been saving for an easy weeknight dinner. Truly, I am all about making recipes that are really good, but adding a few short cuts - like prepared pesto. My kitchen is too tiny to include a food processor to make homemade pesto, consequently I do rely on Trader Joe's little jar of deliciousness to make some fabulous dinners. This smoked salmon pasta was a winner! 1. Cook pasta in boiling salted water according to package directions. During the last minute of cooking, add peas; drain. 2. Heat a large skillet over medium-high heat, add cream. Simmer 3 minutes or until cream is slightly thickened. Reduce heat to medium-low and add cream cheese and pesto, whisking until smooth. 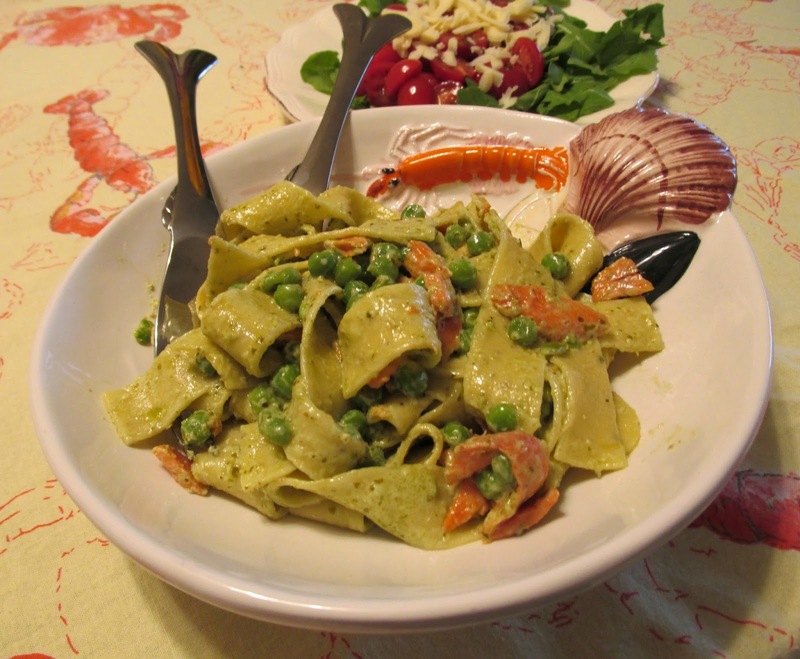 Stir in pasta and peas; cook 1 minute tossing all together until the pasta is completely coated with the pesto sauce. Remove from heat, gently stir in salmon, lemon zest, lemon juice. Add salt and pepper to taste. 3. Dish into pasta bowls - finish with a pinch of sea salt for extra yumminess! Serve with a fresh salad and a great glass of wine to have an easy weeknight celebration. The lemon pepper pasta just gives this an extra special lemony taste - perfect compliment to salmon. Enjoy! In case you are wondering about the Fish Flatware - Here's click here for more info. P.S. The Thrift Shop Song! Relax and Live at the Beach Every Day of the Year! Bedrock Industries - My Kind of Recycling! 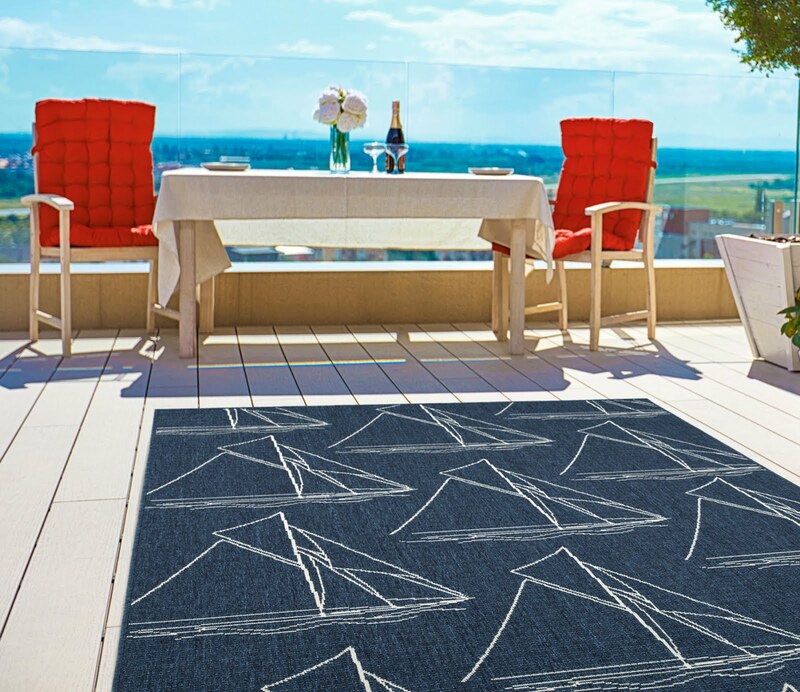 10 Ideas for Coastal Decorating with Oars and Paddles! Quinn Sharp - Beach Jewelry Extraordinaire! Share our Blog with More Beach Friends! 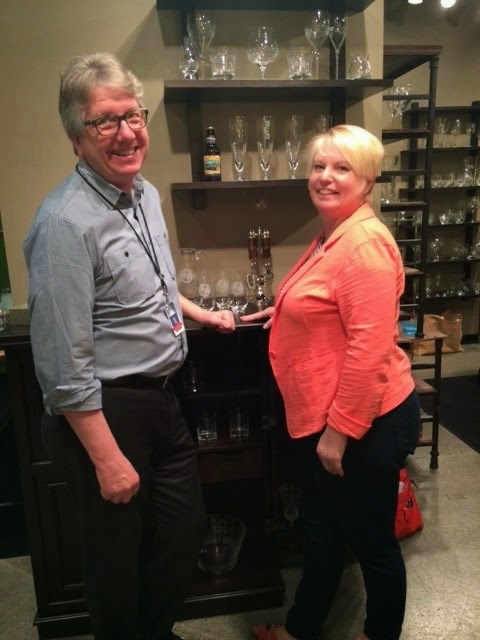 For the 7th year in a row, Caron's Beach House has been accepted into the Fab 100 Club at Rolf Glass! Create your own Latitude and Longitude Art! 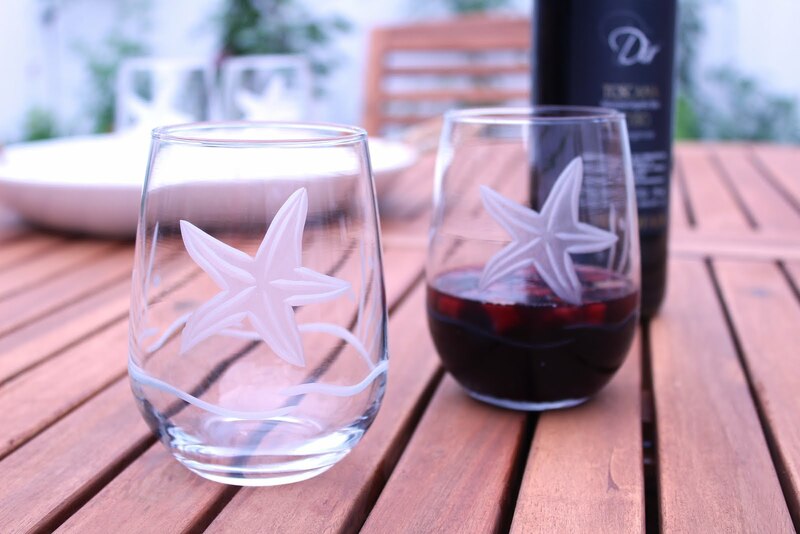 Our Coastal Glassware Makes Entertaining a Beautiful Experience! 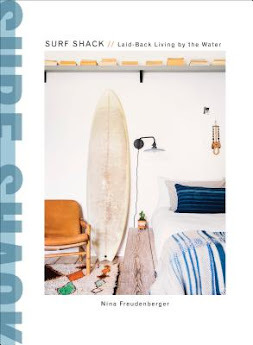 Visit Caron's Beach House's profile on Pinterest. 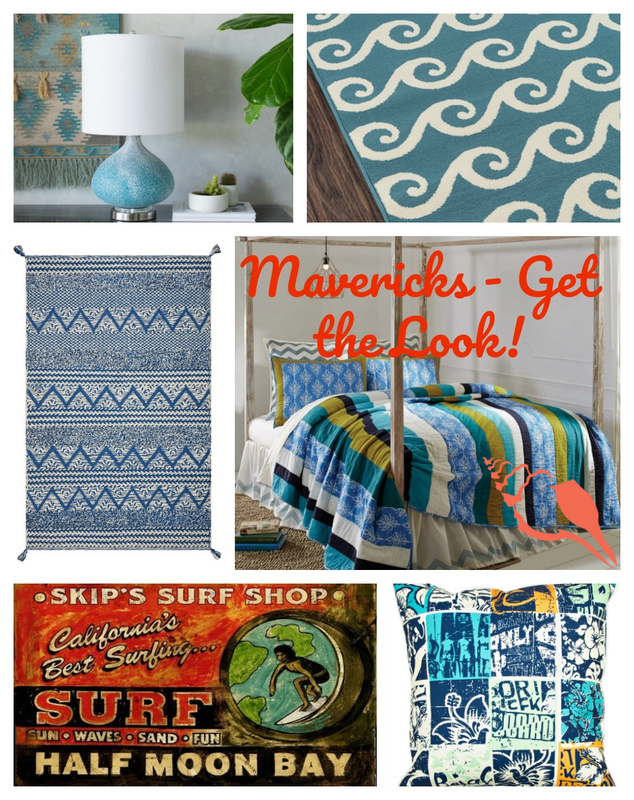 Surf's Up - Our New Maverick's Bedroom Collection! So many colors, styles and sizes! 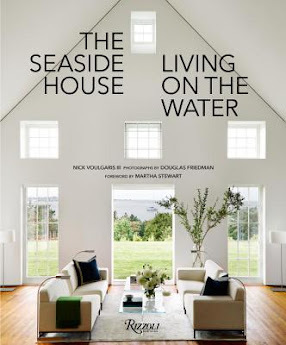 Caron's Coastal Design Book Recommendations! Two Looks In One - Totally Reversible! 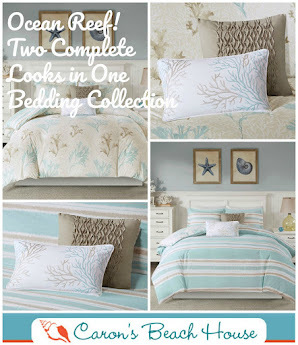 Join the Coastal Decorating and Lifestyle Conversation on Facebook! 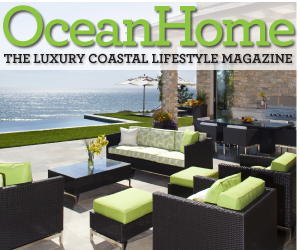 Coastal Home Ideas on Houzz - follow us! Before starting a bathroom remodel, search for bathroom ideas and interesting products, including one-of-a-kind bathtubs, vanities and bathroom sinks. 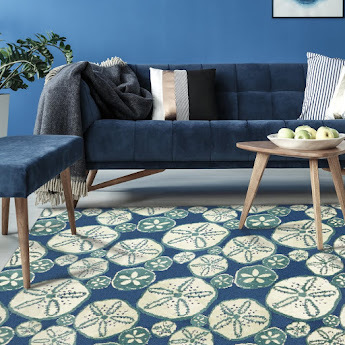 Browse top designers interior portfolios, from high-quality bakeware and decorative plates to ideas for remodeling bath and kitchen. Caron's Beach House 2012. Picture Window theme. Powered by Blogger.